How many times you found yourself in the situation when you had just started an interactive database task and realized it was taking too long to finish? How many times have you found yourself in the situation where you selected and sorted 20GB of Wikipedia data on a PDA without the right index and were waiting forever? How many times you found yourself in the situation when you invoked the wrong task by accident and could not stop it unless you pressed “FACTORY RESET”? All those situations can be under your control by using the new Empress Cancel Functionality. Empress Ultra Embedded V10.20 Cancel Functionality powers-up application developers to implement an effective interactive response for their real-time applications. All Empress Kernel Level API mr routines are synchronous in After an application calls a mr routine, it has to wait until the Empress database engine completes all internal operations in regards to that specific routine. Then the question arises: how one can cancel a synchronous processing of any mr routine? Let’s assume that an application performs database tasks using Empress routines API in one thread of execution – we will call this thread a worker thread. Empress new Cancel Functionality utilizes another thread of execution to check routine executing in the worker thread and cancel its operation. 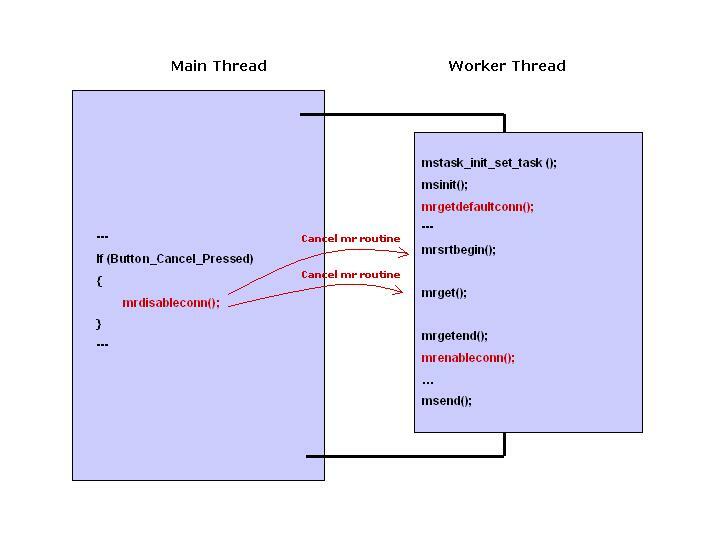 In the following pseudo code example cancel_db_task starts two threads, a worker thread where all database tasks are performed and a main thread used for canceling mr routines in the worker thread. Cancel activity is triggered by invoking the routine mrdisableconn(). Empress Cancel functionality can be useful for developers of interactive applications. On the other hand, developers may find that Empress Timeout functionality may be more convenient for those applications that run without user interaction.